Attention Izannah Walker Class and Alabama Baby Class Students!!! Attention Izannah Walker Class By Mail students and Alabama Baby Class Members, Ning just let me know that they are definitely shutting down my Spun Cotton class site on 10/1/16. I have not received notices for my Izannah class or Alabama Baby class yet, but I am sure I will. There isn’t going to be any reprieve this time around. If there is information on the class site you want to save, you should do it now! Also if you are interested in joining a private facebook group for class members only please go to the appropriate Ning class site and click on the discussion about the site closing and post your response. If you are a member of BOTH classes, please post on both sites. The posts on the class sites are how I am keeping track of who votes yes and also who is eligible for inclusion in a private facebook group. Only current class members can access http://www.izannahwalker.ning.com and http://www.alabamababy.ning.com. 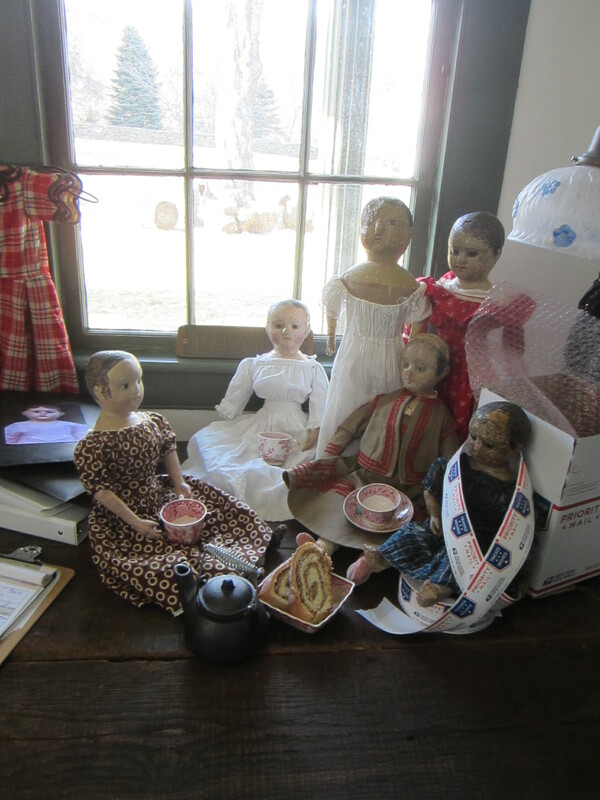 If your New Year’s resolution is to learn something new, and you were thinking of ordering one of my classes by mail, my new Izannah Doll Kit, or my Izannah doll clothes pattern they are only on sale for the next 53 hours, until midnight December 31st, 2014. To make my new kits extra special for the Christmas sale, your Kit order will include one tiny cut and stitch Isane panel so that you can make your doll a little Izzy of her own. 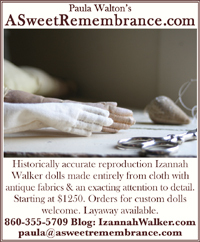 Plus, you receive a coupon for 10 percent off any of my classes by mail or a finished reproduction Izannah Walker doll, through June 30, 2015. Visit my website A Sweet Remembrance to shop the sale. I’ve thought up lots of ways to use my new printed fabric doll panels, but I bet you can dream up even more great ideas of your own! Just for fun, I’m having a contest to see who can design and make the best project using my printed doll panels. The rules are simple. 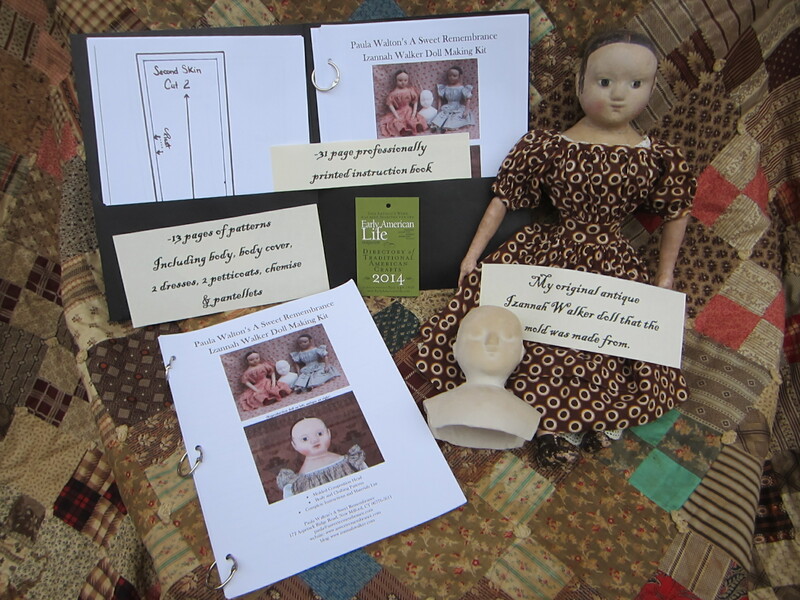 Buy a doll panel, make it into something wonderful, take a photo and email it to me – paula@asweetremembrance.com – before January 31st, 2015. I’ll post all of the photos on my blog, then invite readers to vote for their favorite. The winner will receive one panel each of my complete collection of tiny cut out and stitch fabric dolls, which is a prize worth $100. Good Luck!!! The girls spent this morning helping out around my office. 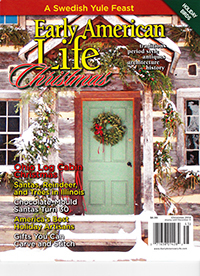 We are busy getting all of the classes people have ordered during my Christmas Sale made and ready to ship. If you are a long time customer and blog reader, you’ll know that I always try to have some sort of sale at Christmas time as a way of saying Thank You to everyone for all of your support, encouragement and friendship throughout the year. I have the very best customers and students in the world!!! 12/16 – One more excellent question – Thanks Judy!!! Q: Can I paint the composition head with acrylic paints instead of oils? A: Yes. You will get a slightly different, drier look without the soft edges of oils, but you may certainly use acrylic paint if you prefer. 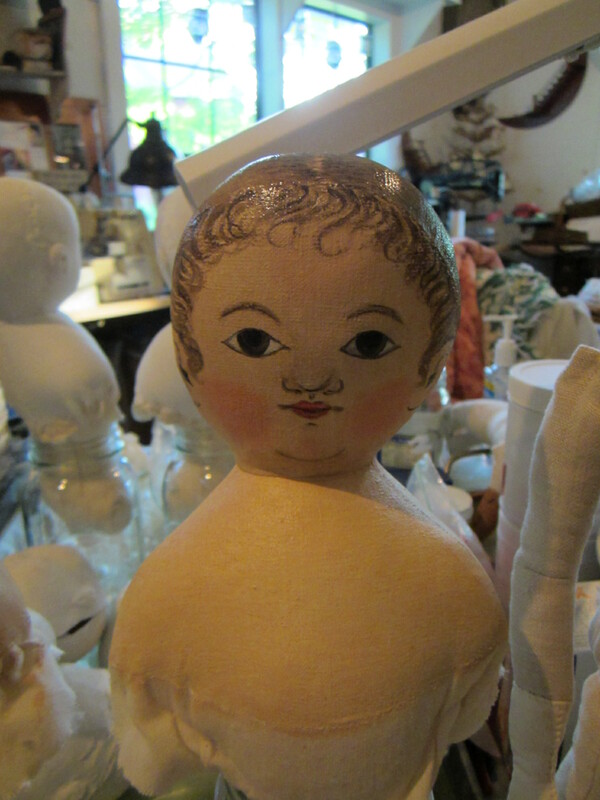 A: Yes 🙂 I do know that someone just bought a well known doll maker’s molds and fabric and is now making reproduction dolls with composition heads. A few days ago, she also began selling doll kits that include composition heads. – My kit makes an 18 inch tall doll. The other kit has heads that make a 15-16 inch doll. – My kit includes a professionally printed 31 page instruction book and 13 pages of printed patterns. The other kit is currently being sold with emailed instructions and patterns sent in an electronic file. The buyers would need to print the pattern pieces (and optionally the instructions) themselves. 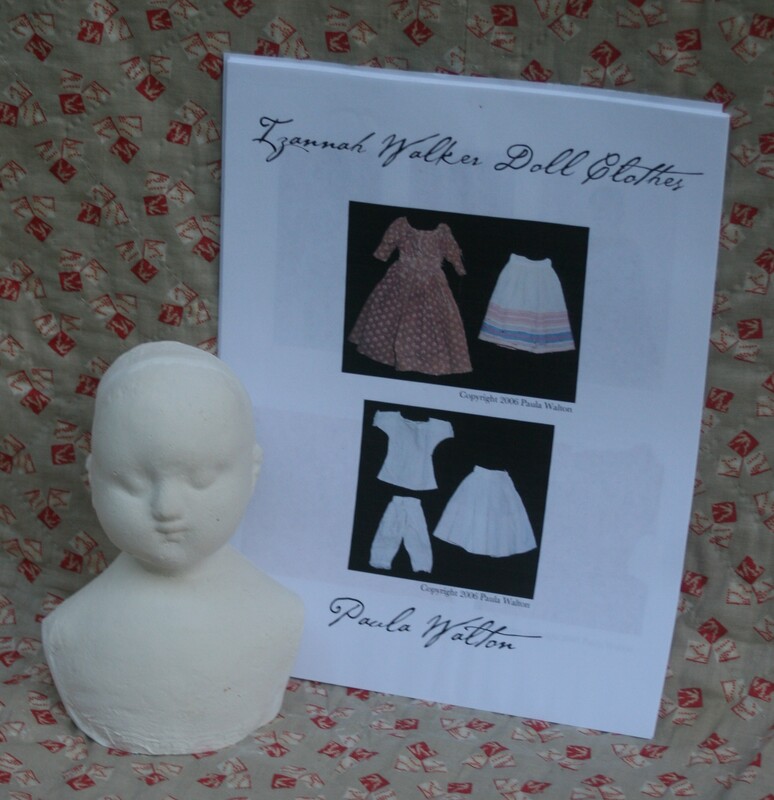 – My doll clothing patterns include two dresses, two petticoats, a chemise and pantalettes, all of which were drafted from original clothing belonging to one of my antique Izannah Walker dolls. 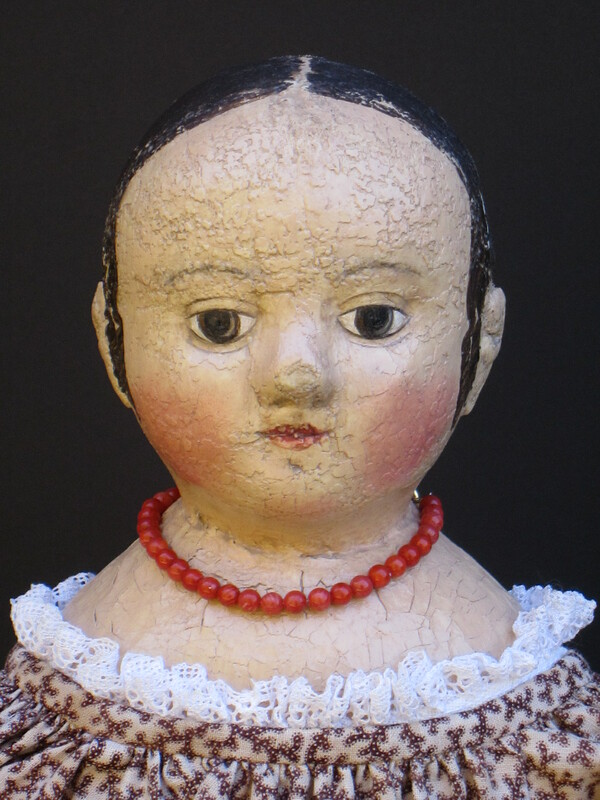 – My kit includes numerous color photos of Isane, the actual antique doll whose head I used to make the molds for the composition head. They are included in my instruction book for reference when painting your doll. 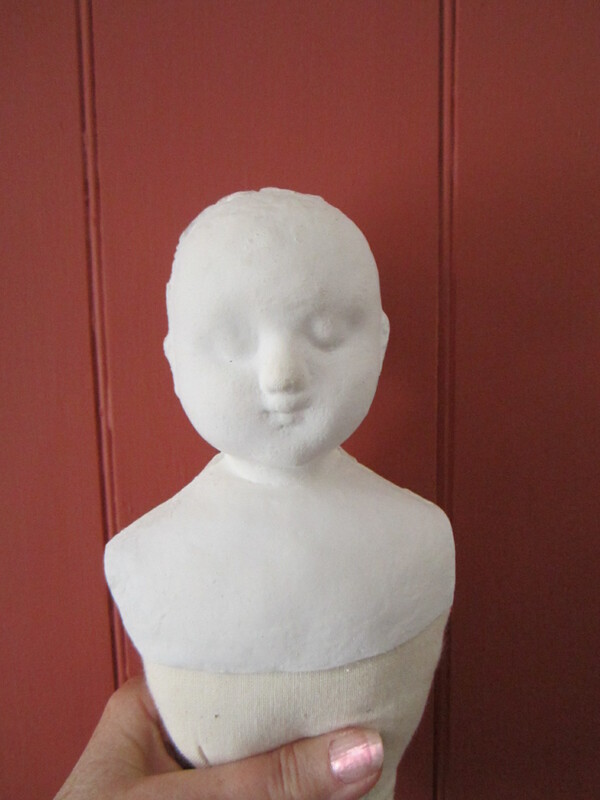 – I have just one doll head, Isane, available in kit form. 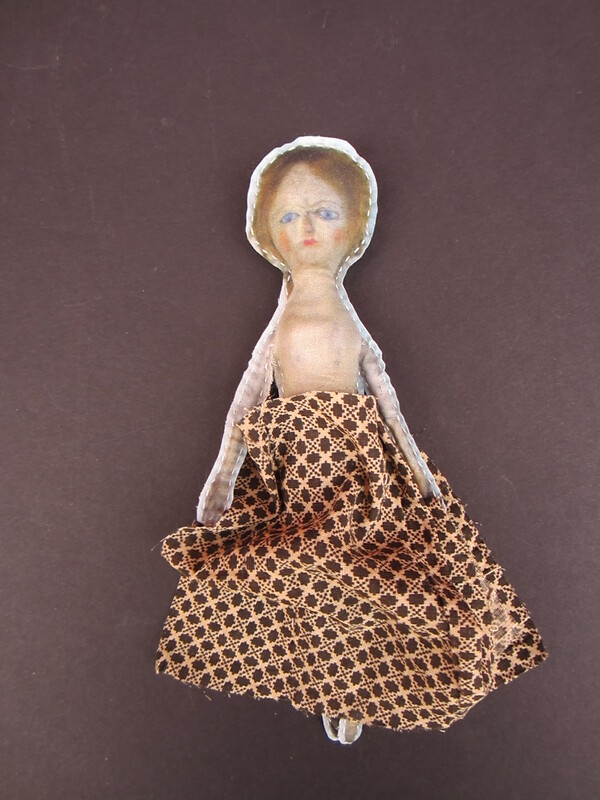 I am only making finished dolls with pressed cloth heads from my seven other molds. 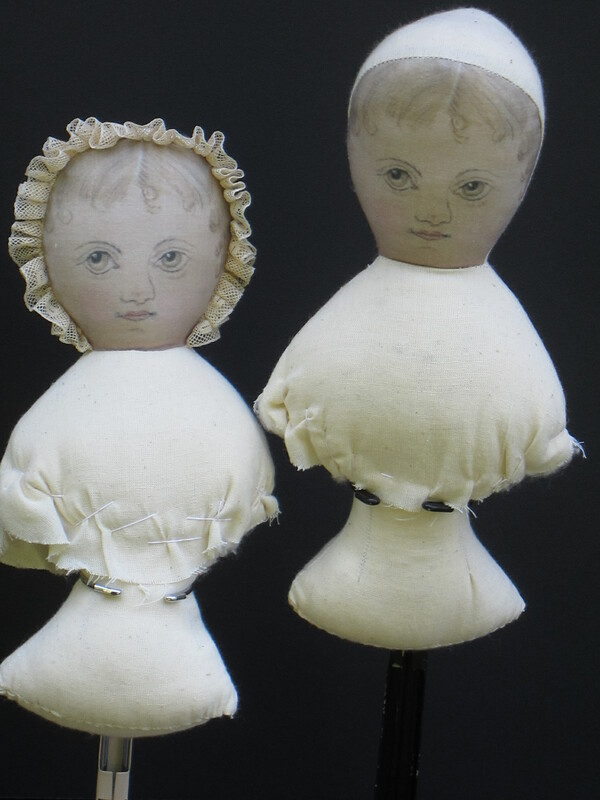 I will also still be making dolls with pressed cloth heads from Isane’s mold. The Australian kit has three choices of heads, one of which is Isane, the doll I now own (labeled Patience in that kit). – If you are a bit nervous about painting the head that comes with your kit, you can commission me to paint it for you. I’ve been making and painting Izannahs for years and I love painting them. You may choose any hair style plus other custom options. Here are some examples of how I paint Isane. Those are about all of the differences I can think of. 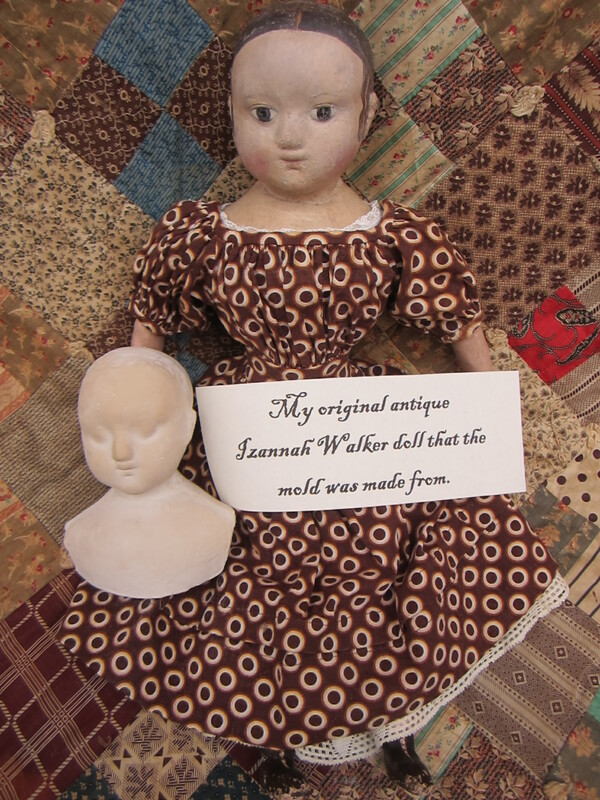 No matter what your choice, I am sure you will enjoy making a reproduction Izannah Walker doll of your very own! 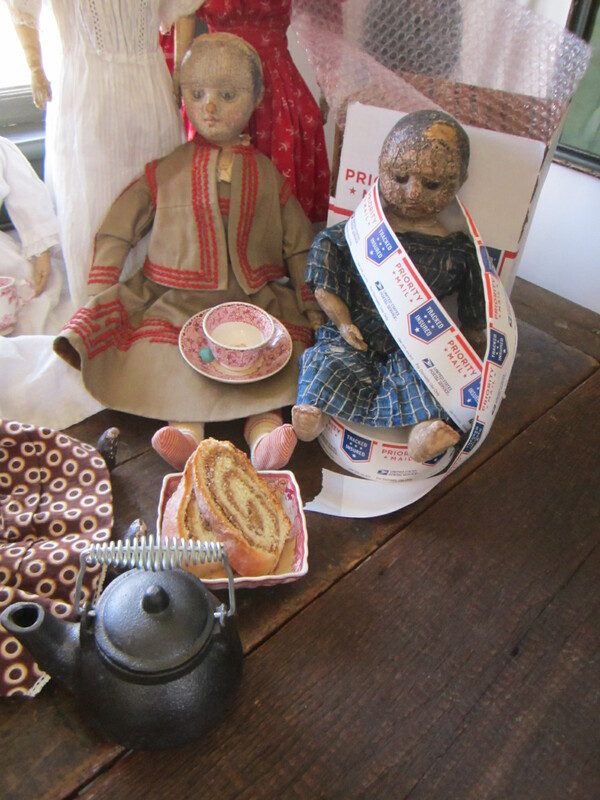 *read more about my doll making kit and Isane’s story here. 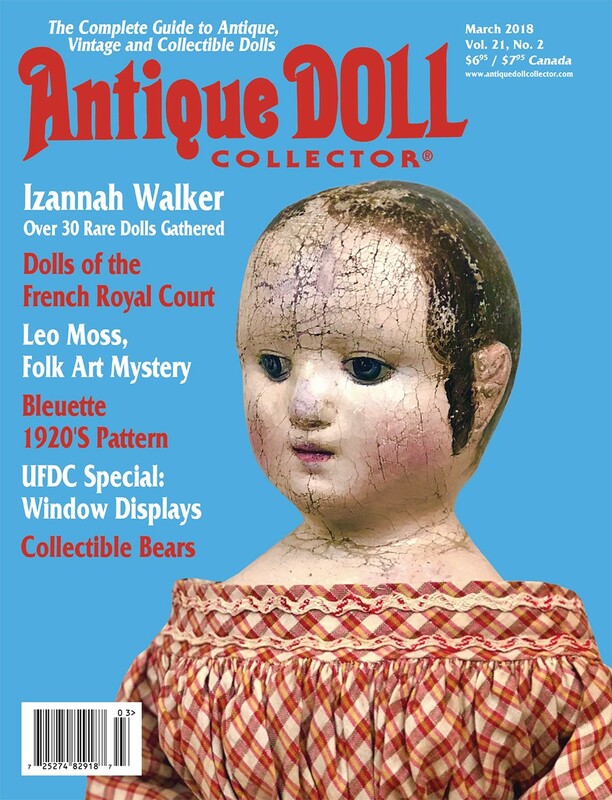 My new Izannah Walker doll making kit. 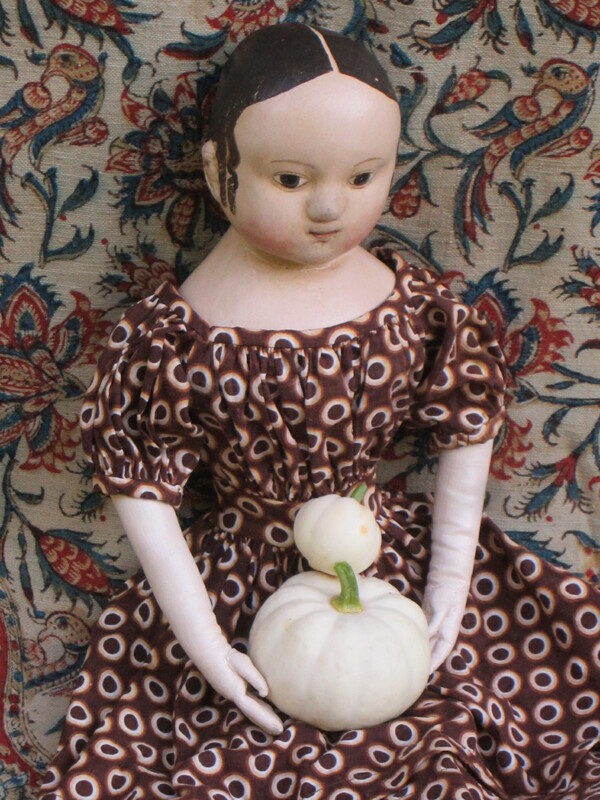 I have two very fun new doll making items available just in time for the holidays! 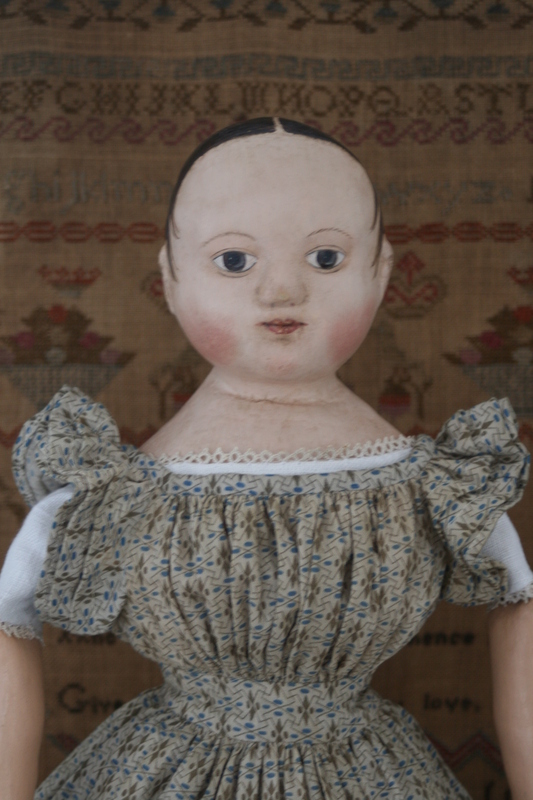 Izannah’s original dolls were made with pressed cloth heads, which is a wonderful, but extremely difficult doll making skill to master. 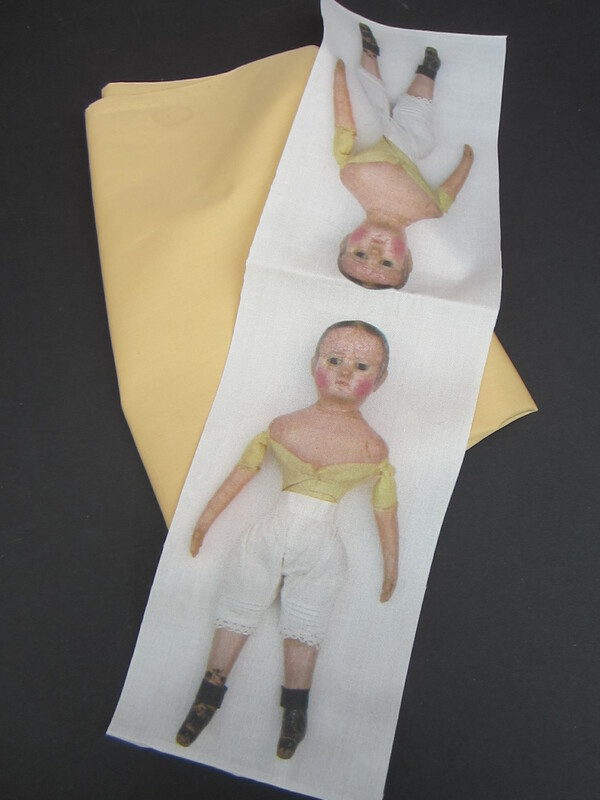 When I make the reproduction Izannah Walker dolls that I sell, I do make authentic pressed cloth heads. 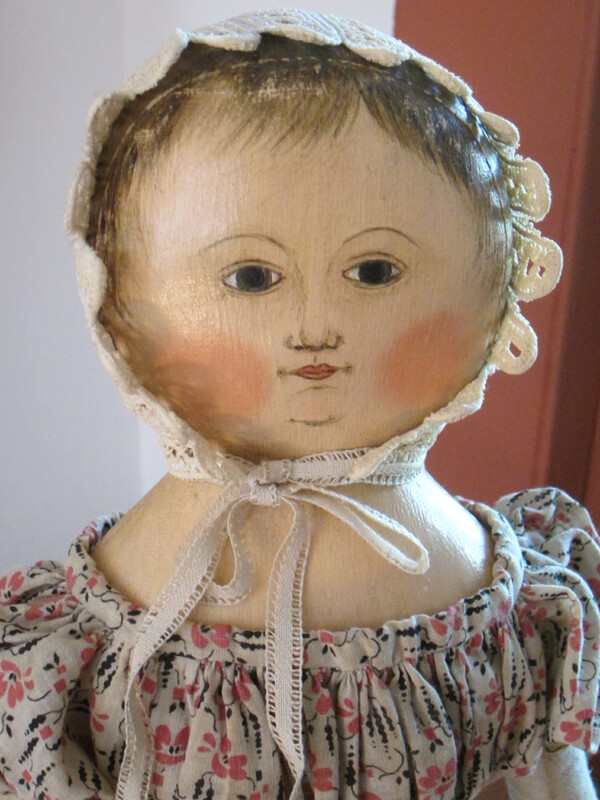 I also teach a master level class on how to make a historically accurate, pressed cloth head reproduction doll, but that class isn’t right for everyone. 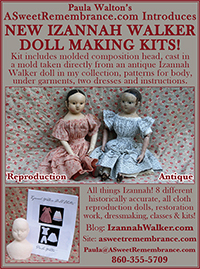 If you’d like to start off a little slower and try something a bit easier, for your first reproduction Izannah, this kit is the way to go! The new kit is less challenging than my Izannah Walker Doll Making Class. 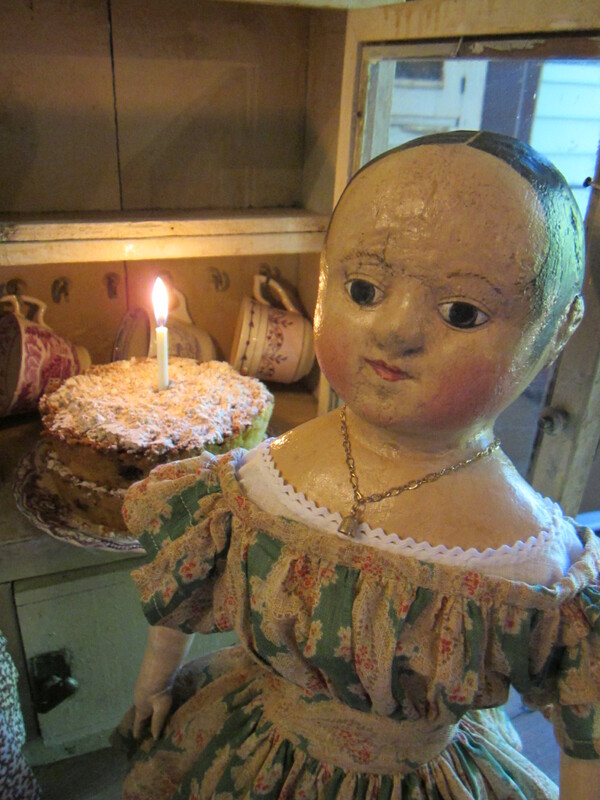 Included in the kit is a poured composition head, cast in a mold that I made directly from Isane, one of the antique Izannah Walker dolls that I own, which will enable you to make a faithful representation of an 18 inch antique Izannah Walker doll. 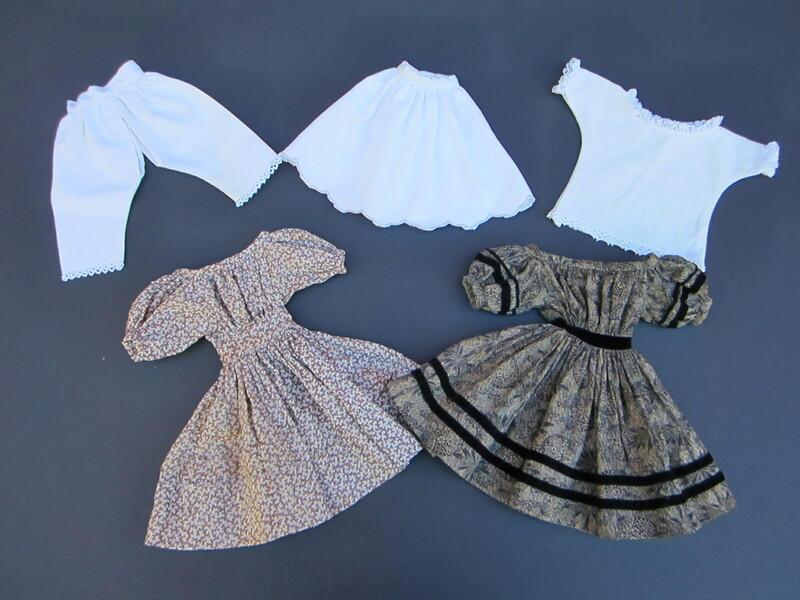 The kit also comes with patterns for the doll’s body, under garments and two dresses, plus a 31-page instruction booklet filled with detailed color photographs. This kit is suggested for experienced seamstresses who are also well versed in painting with oils. 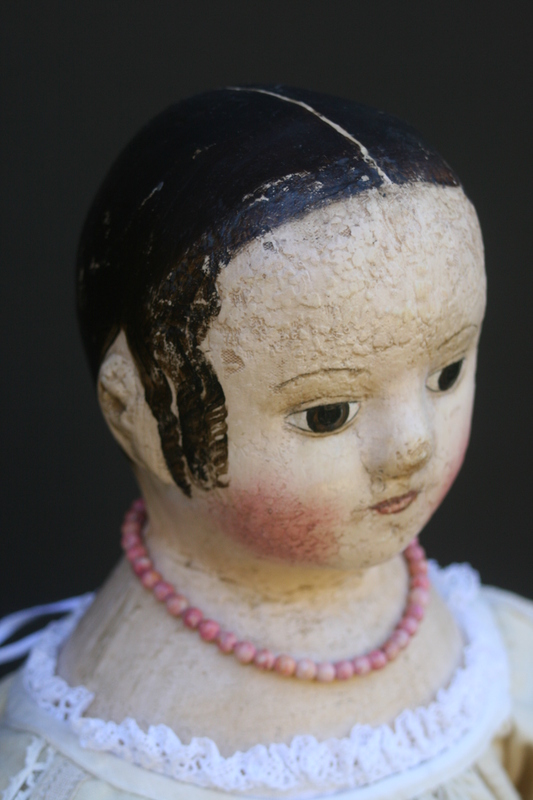 If you do not feel confident enough to paint the doll’s head yourself, you may commission me to paint it for you. The original Isane, on the right and my reproduction of her on the left. 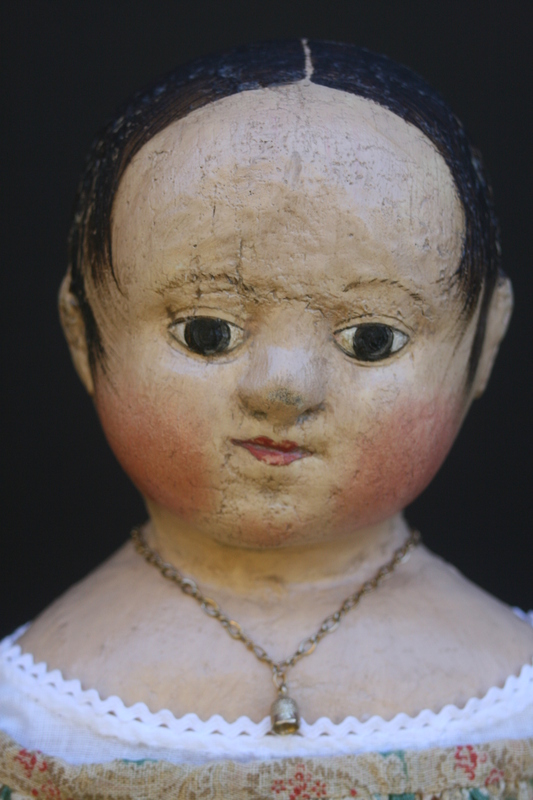 Isane, the doll whose head is reproduced in my kit, is a true doll maker’s doll. She has a very interesting past. 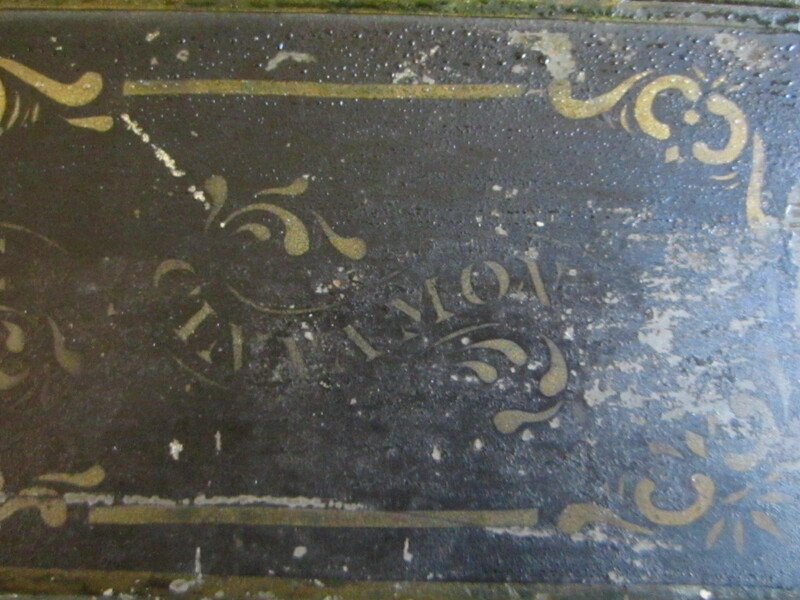 Originally made by Izannah Walker, she was later repaired and repainted by the Martha Chase factory. 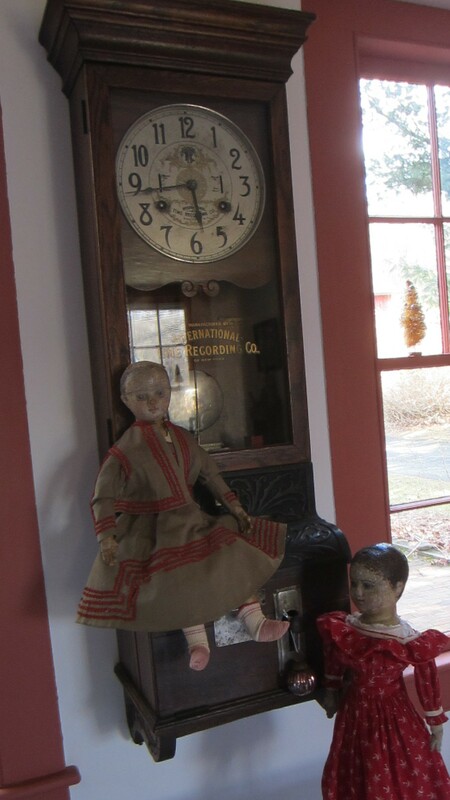 Izannah Walker and Martha Chase, both famous and well-loved doll makers, also both lived in Rhode Island. 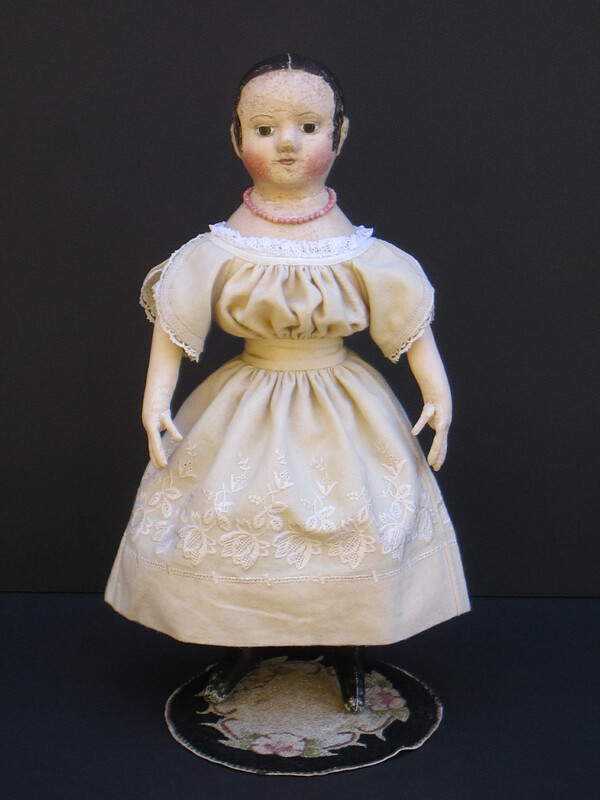 In fact, at one time Martha Chase’s father was Izannah Walker’s physician and when she was a child young Martha owned a doll made by Izannah Walker. 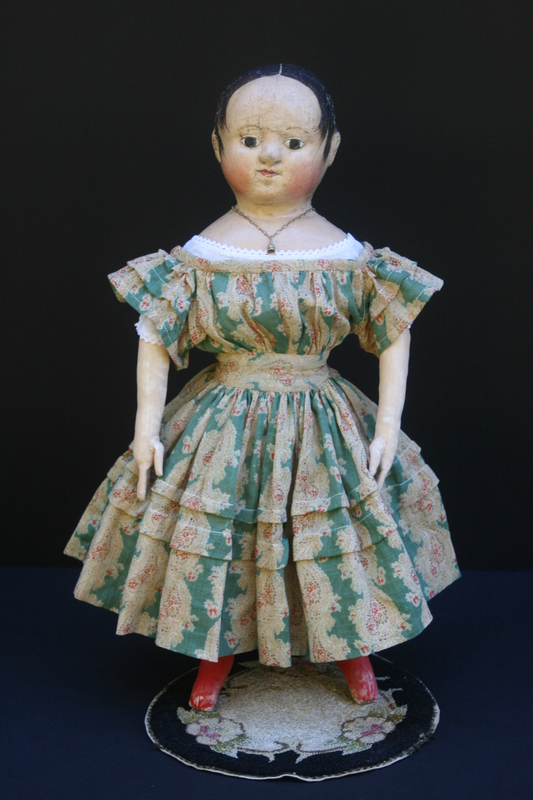 Later when Martha Chase grew up and became a doll maker, one of the things her small work force of women did, in addition to making new dolls, was to repair older ones. 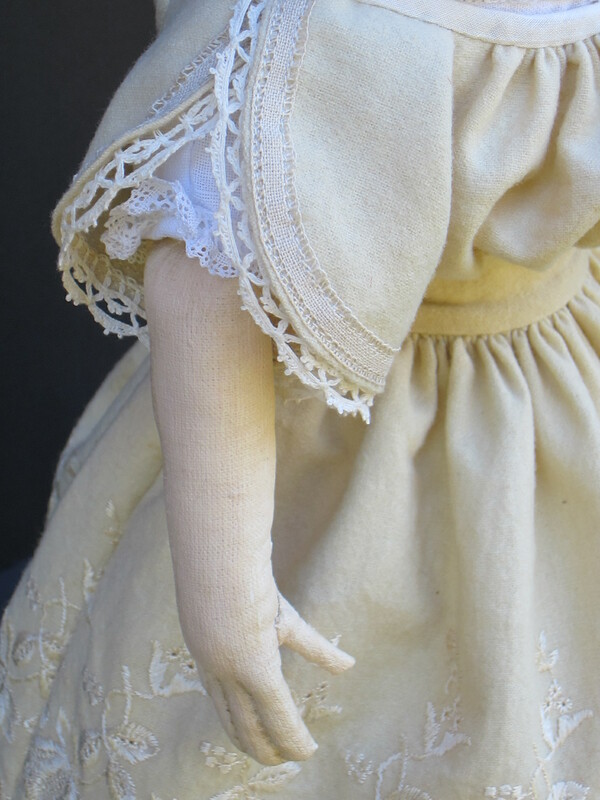 The real Isane has very old Martha Chase arms and legs from one of her character dolls, rather than the chubbier ones found on her baby dolls. She also had traces of the highly recognizable Martha Chase pink flesh tone on her face and shoulders plus a Martha Chase body covering. One of the many things I love about Isane is this meld she represents of two awe inspiring American women doll makers! 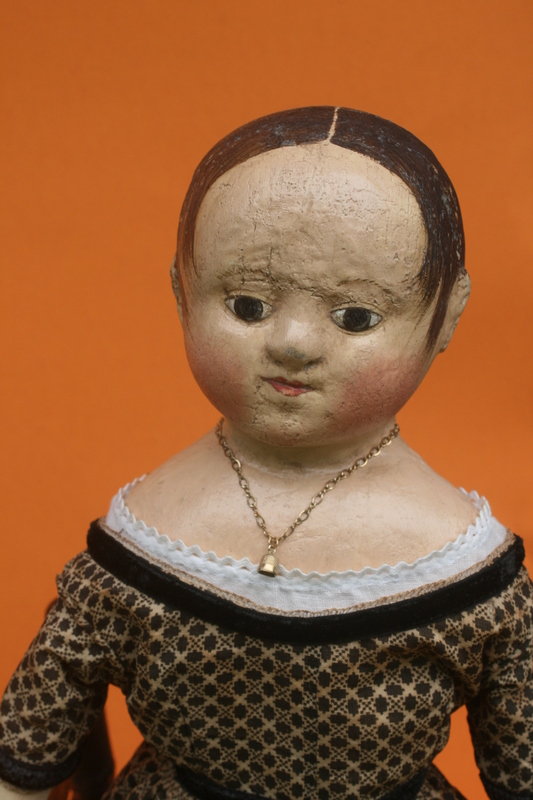 I’m sure that Isane left the Martha Chase factory and went on to have many, many wonderful years as a beloved plaything, eventually winding up several years ago in the collection of a talented doll maker, who lives in Canada. 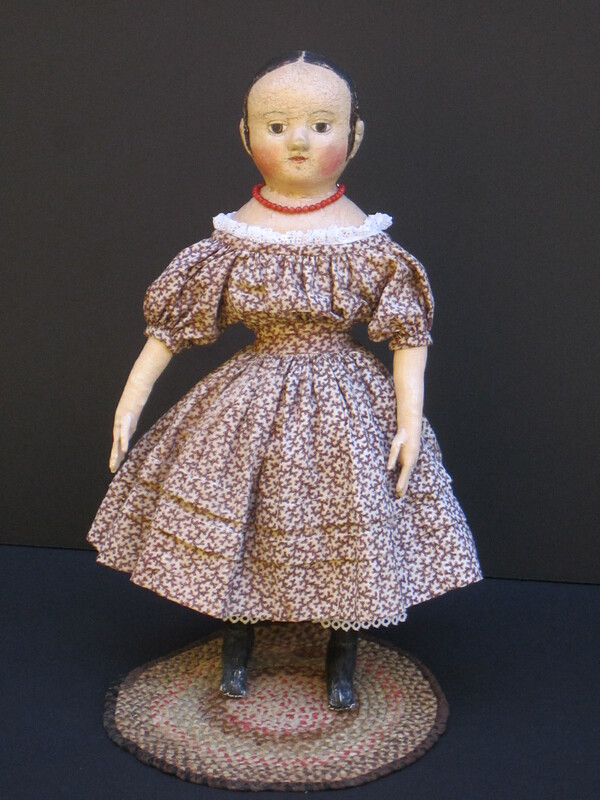 After she left Canada, Isane was owned by at least two doll dealers, one of whom repainted her. 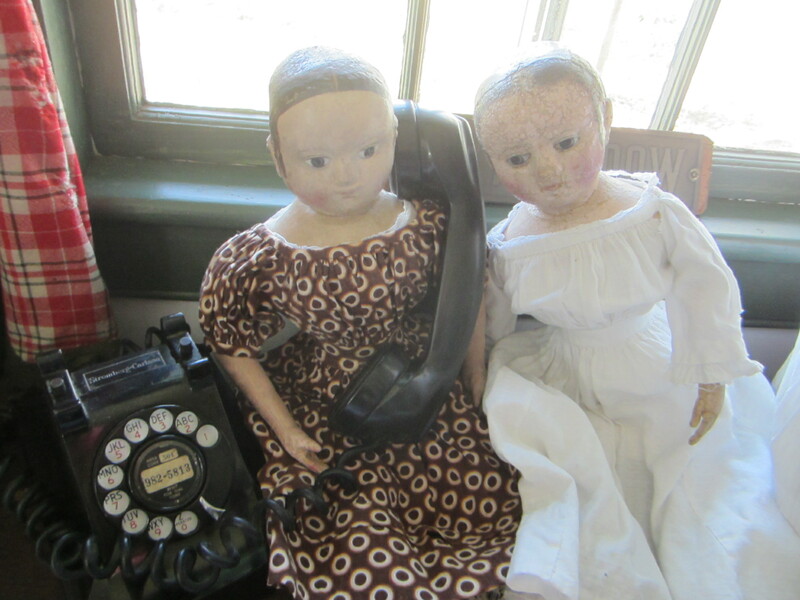 The next stop in Isane’s long life was a sojourn at the home of Edith O’Neil, who is a wonderful artist, doll maker and collector. 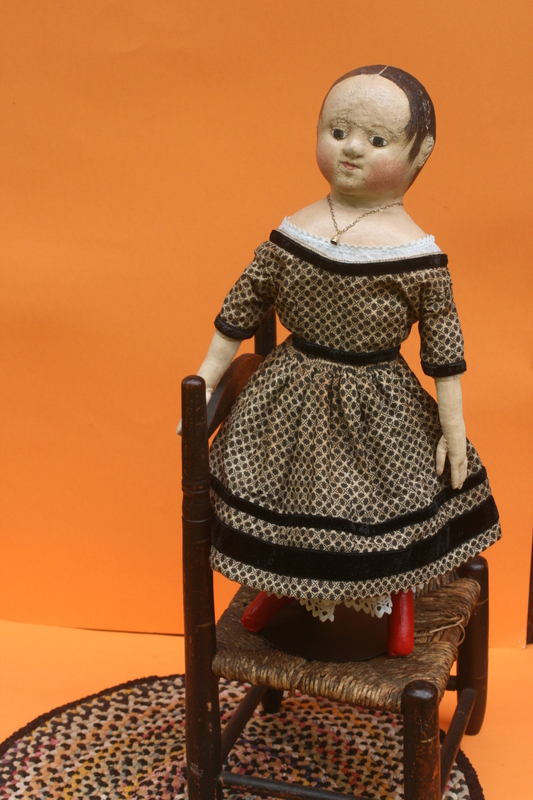 Edyth named the doll Patience. In the fullness of time, Isane came to live here with me, where she acquired a new name, and after I did 60 + hours of restoration, regained her old face. I’m fairly sure that Isane’s relationship with Martha Chase has not been mentioned or even known by some of her previous owners. 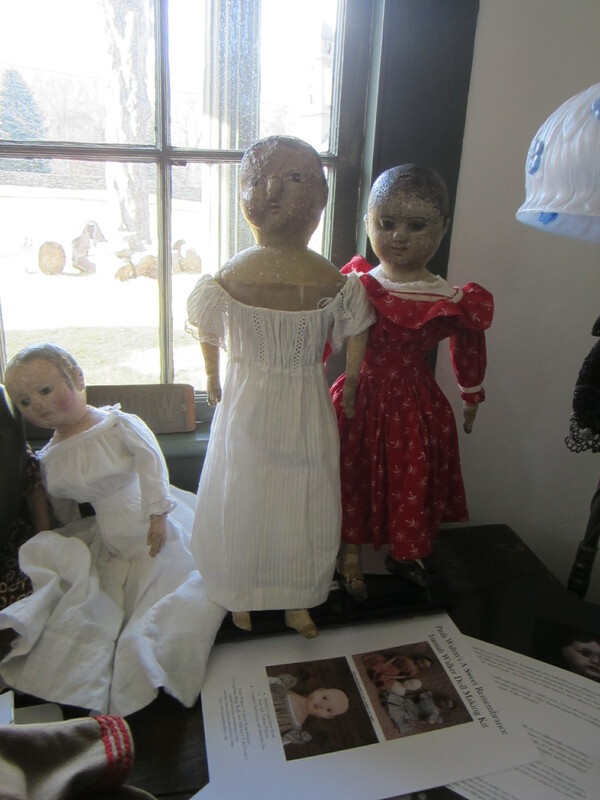 I know about it because of the physical evidence on the doll and my years of experience with both Izannah Walker and Martha Chase dolls. 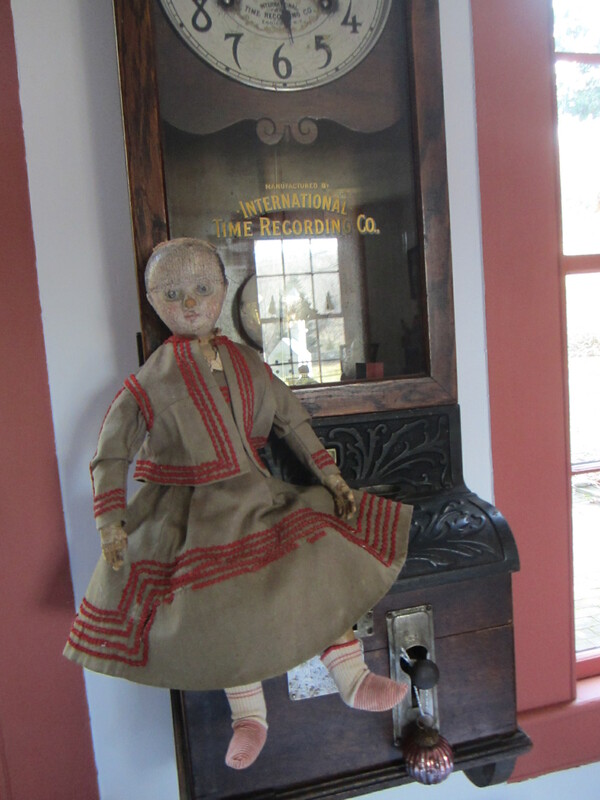 Isane is one of three dolls that I have personally examined and done restoration work on that was undeniably repaired by the Martha Chase factory. Because Isane’s current arms and legs are not the ones she started life with, the enclosed pattern has limbs drafted from one of my other antique Izannah Walker dolls of the same size. Click here to visit my website where you may read more about my new Izannah Kit and place an order for one. Please be patient after placing your order, casting the composition heads is slow and time consuming endeavor, which I am fitting in between all of my many pre-existing orders. 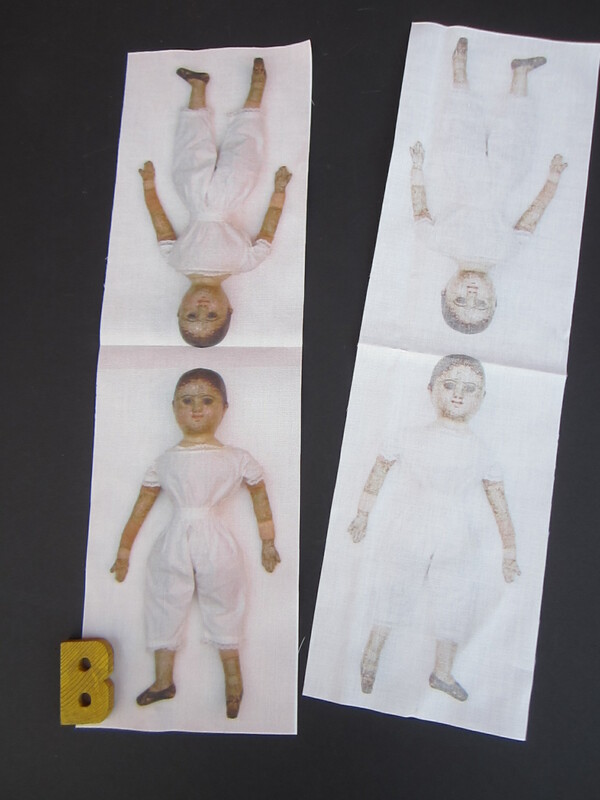 These are my new cut and stitch printed fabric doll panels. 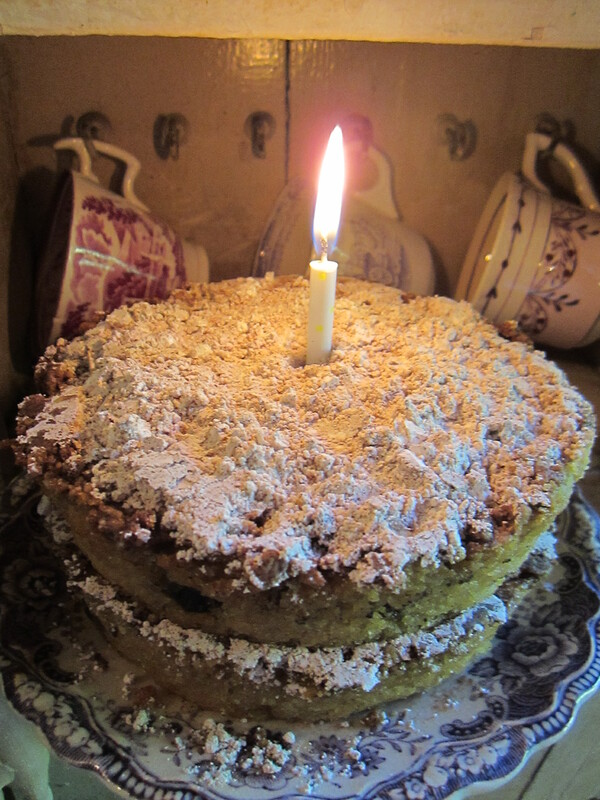 This is the time of year when I long for simple, fun projects to make as gifts for friends and family members. My preference is for small hand sewn items that I can stitch in front of a fire in the evenings, or while talking to my children. Projects that I can pick up and work on for a few minutes when I have little bits of extra time. 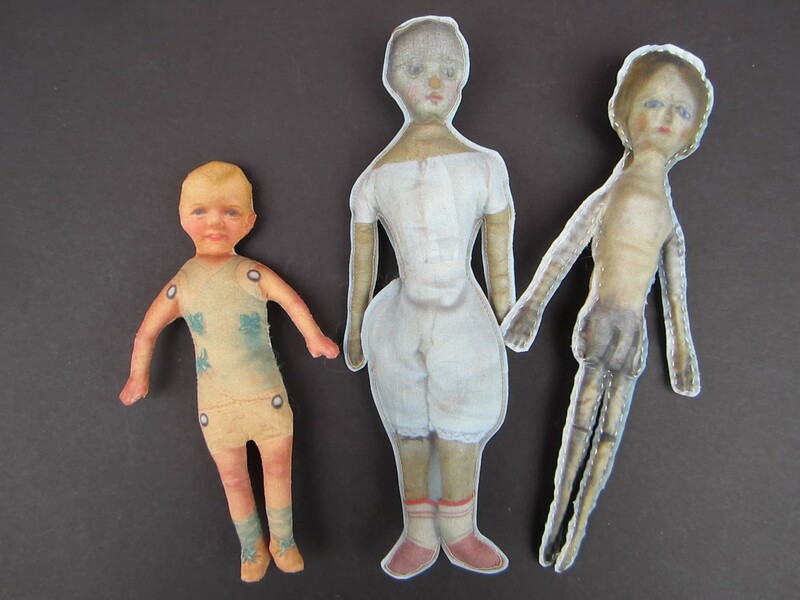 Three different methods of sewing and stuffing my tiny cloth dolls. 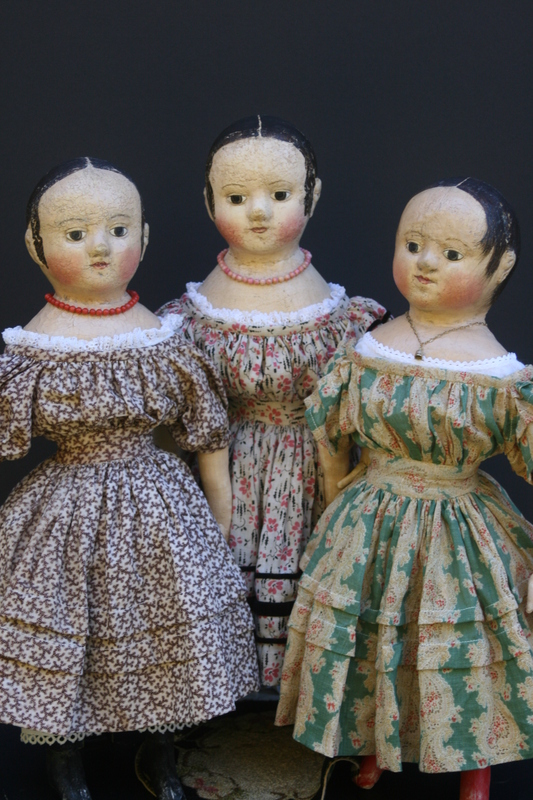 When thinking about a project for this Christmas my mind immediately leapt to the great printed cloth dolls that were popular in the late 19th and early 20th centuries. I’ve always been very fond of all of the printed cut and sew dolls from that era. 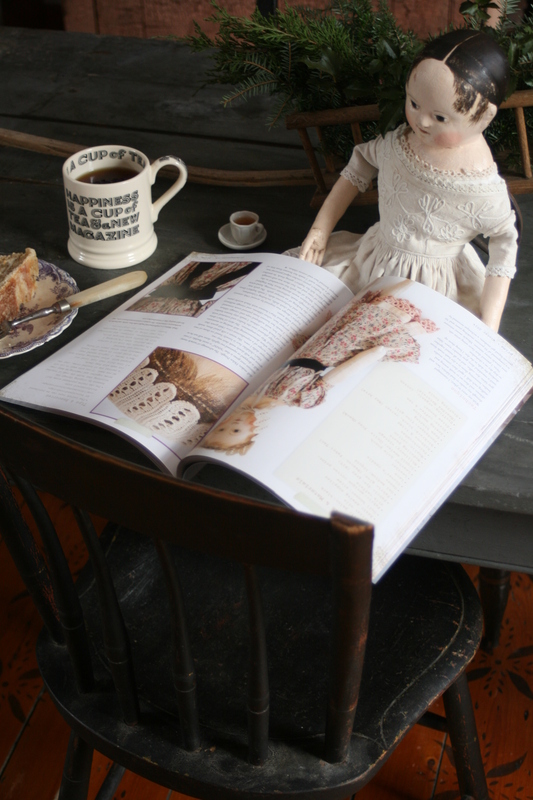 My versions are a combination of printed cloth dolls and photos of some of the antique dolls in my collection. 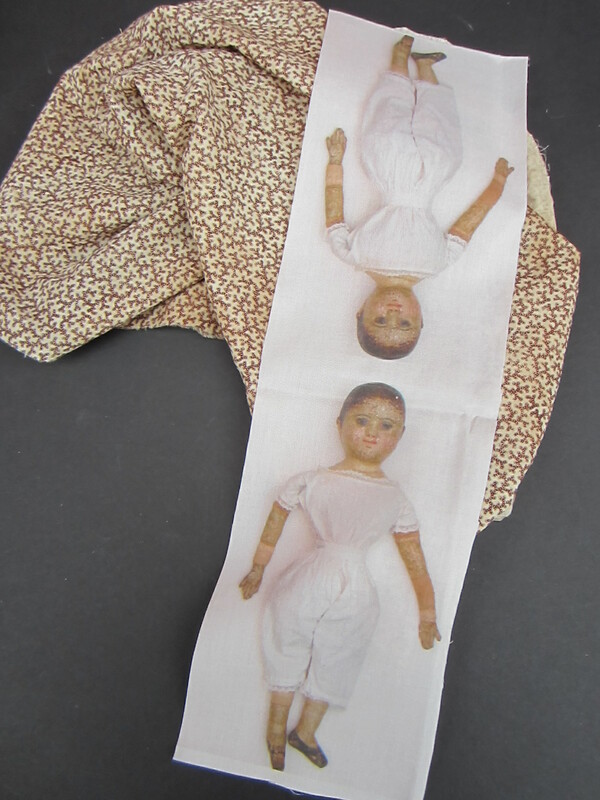 Make two dolls with each panel by adding your own plain fabric on the back. Most of my printed dolls are 8-1/2 inches tall. 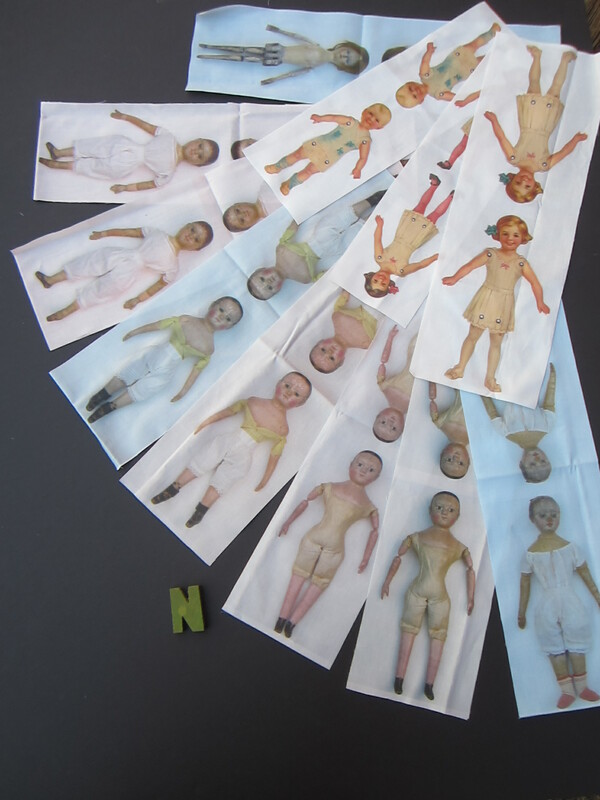 Each doll panel that you buy includes two mirrored doll images, so that you can sew them together back to back, or use them separately with a plain fabric backing, or for applique work. 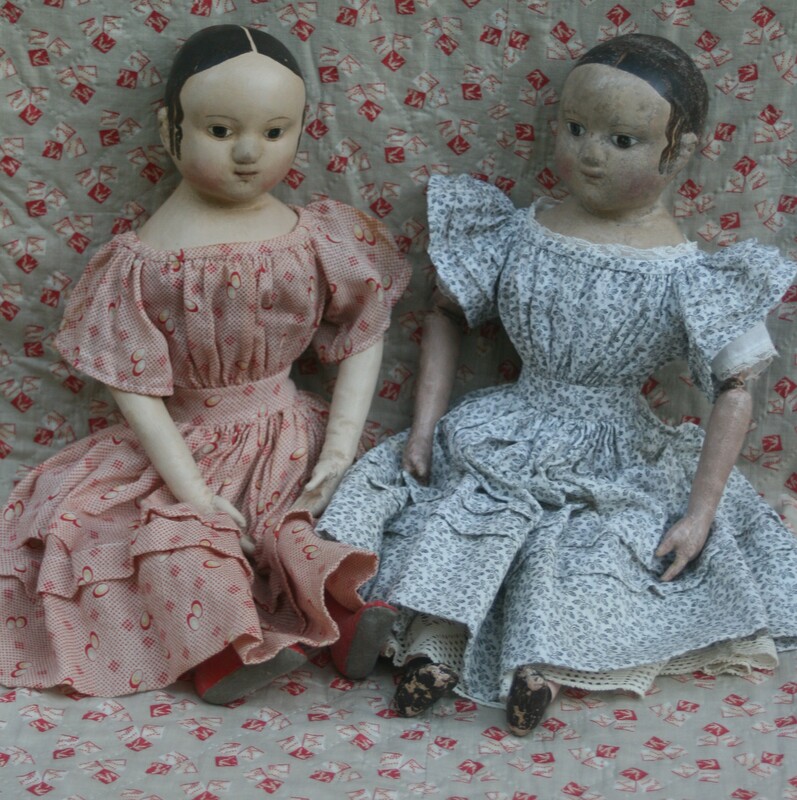 The dolls are printed on high quality 100% cotton fabric and are completely washable. There is extra fabric surrounding each doll that will allow for a ¼ inch seam allowance. 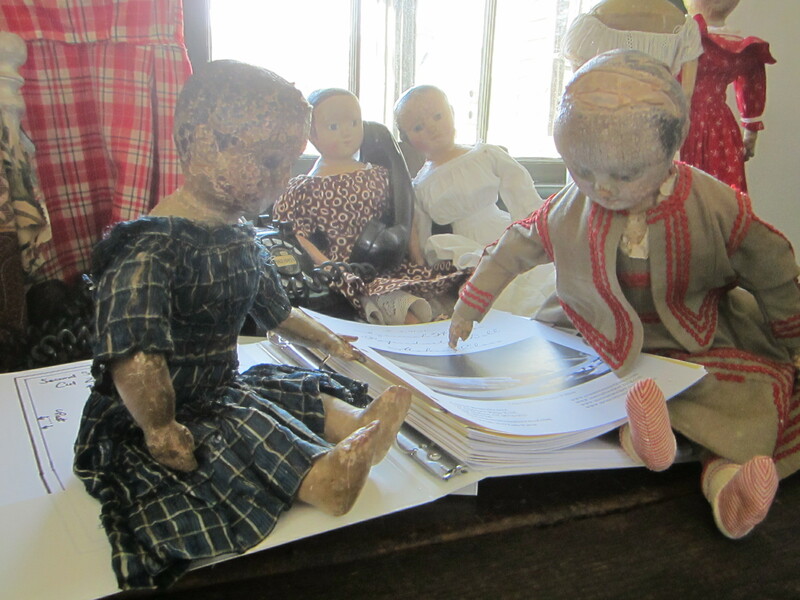 The dolls may be sewn with right sides together, turned and stuffed; machine or hand stitched from the front side, trimmed and stuffed, or appliqued on to other projects. They may also be cut out and used for journaling and other mixed media projects. 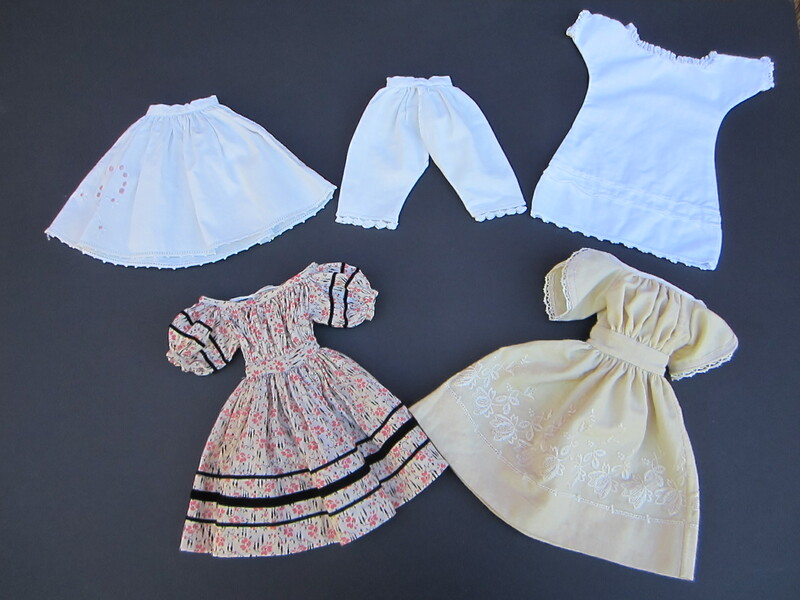 Add bits of fabric, lace, crepe paper and Dresden trims to create doll clothing. 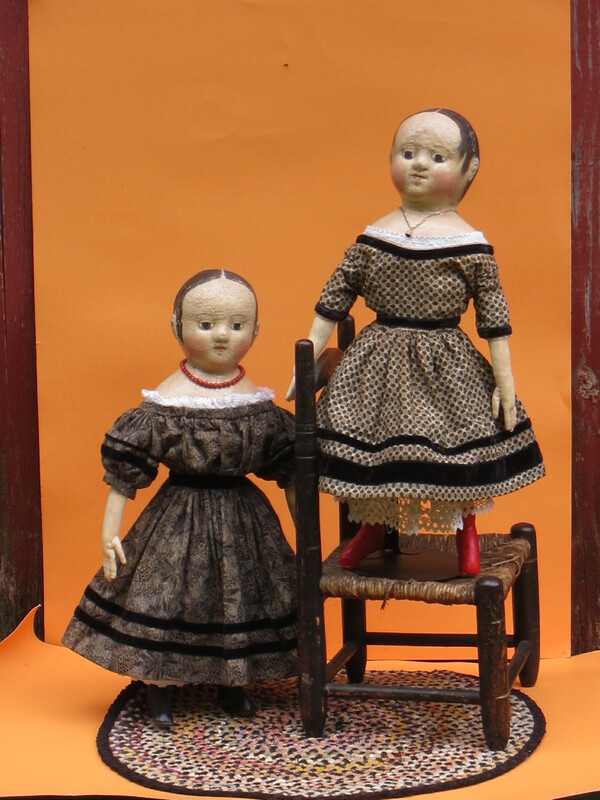 The dolls aslo look quite charming backed with printed fabrics. – Sewn them together back to back for Christmas Ornaments, so the “front” side is always on view. – String several together with ribbon or twine to make a banner ,then hang up across a mirror, window, or mantle. 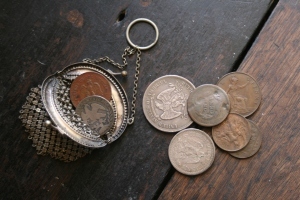 – Hang them individually from cupboard doors or chandeliers. 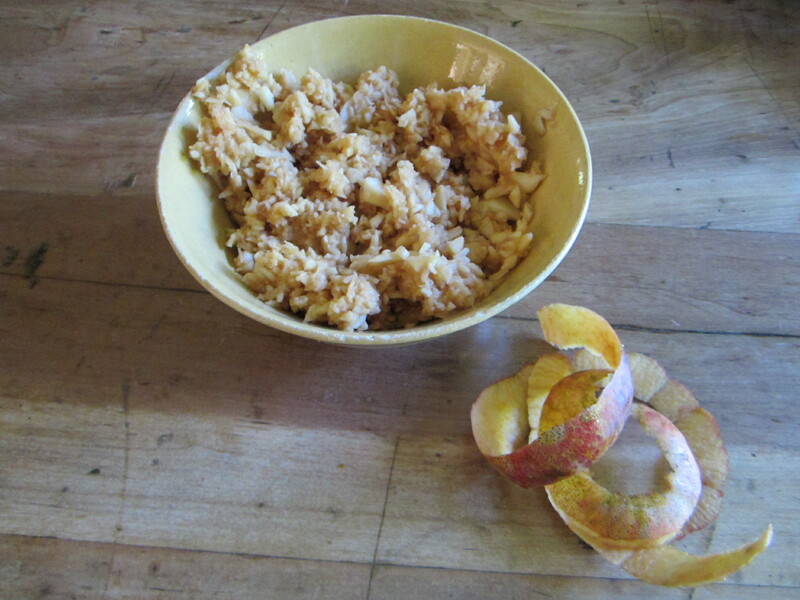 – Make a handful into a mobile. 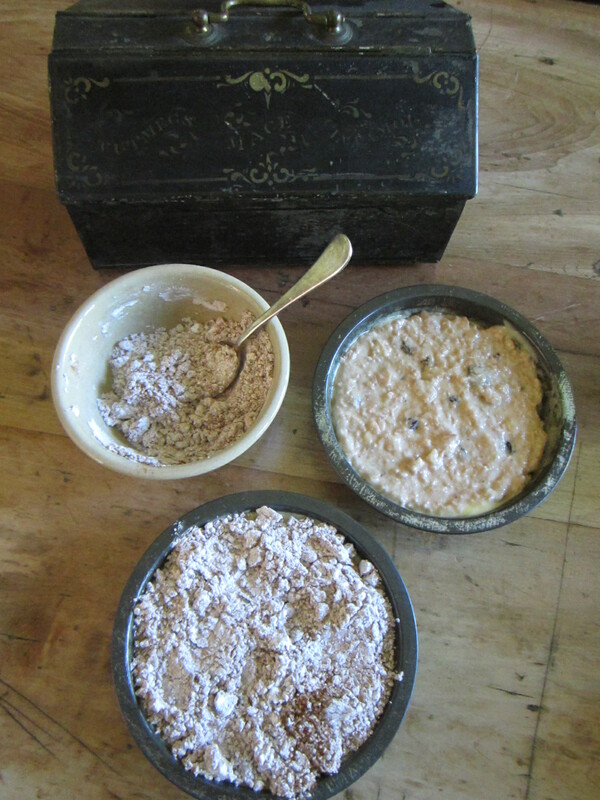 – Stuff several with lavender and use them as drawer and closet sachets for your finest linens and clothing. 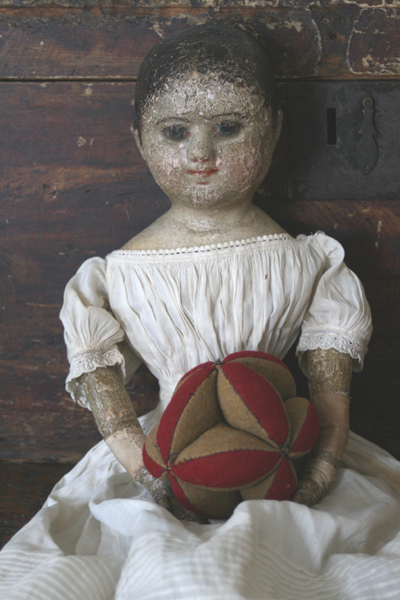 – Fill one with cedar shavings and place it among your doll and bear collection to repel moths. 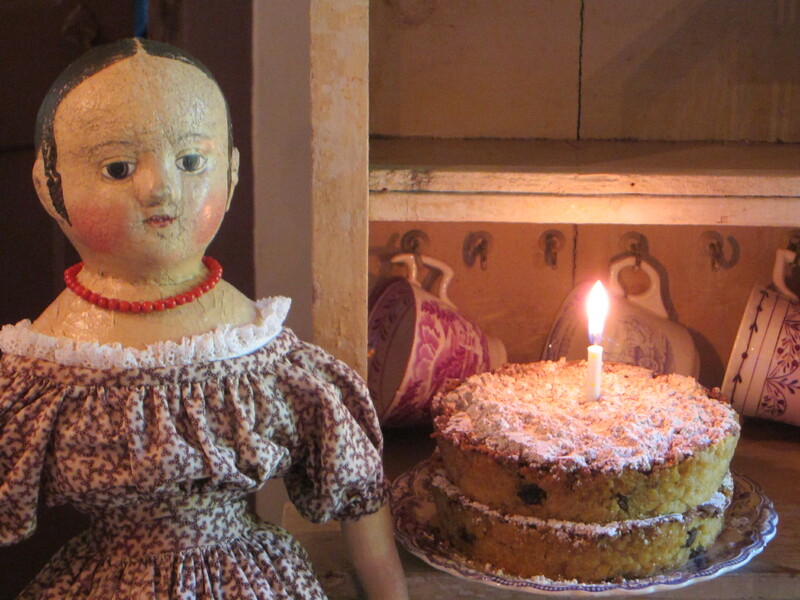 – Make a bunch to give as special party favors for your doll club meetings and events. 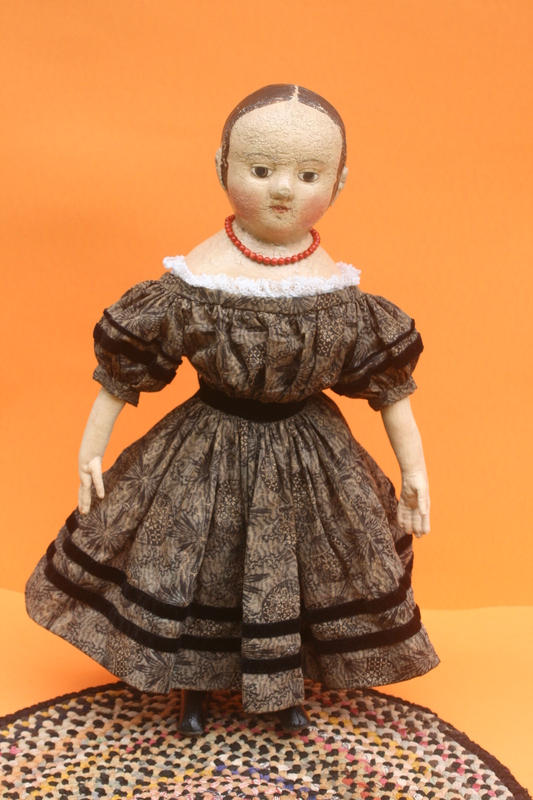 – Make a special doll’s doll for your favorite play thing. – Add a squeaker inside to make a fun dog toy or fill with cat nip for your kitten to play with. -Applique them onto quilt blocks, pincushions, curtains, aprons, pockets, baby bibs and clothing, tote bags, t-shirts and more. 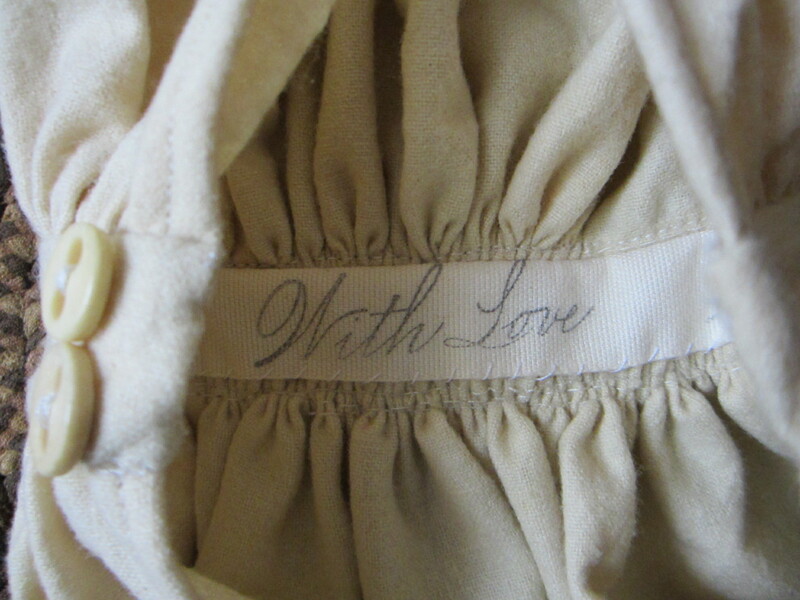 The outline of the doll is clearly visible on the back side of the fabric, which makes stitching them together easier! I’ve tried to keep the costs very modest and I think you will find that it is the same or less than if you printed similar images on purchased printer fabric sheets using your ink jet printer. Plus you have the added advantage of being able to throw them in the washing machine! 🙂 My printed panels are $13 each, $ 30 for any three, $95 for any 10, or buy the entire collection for $100. 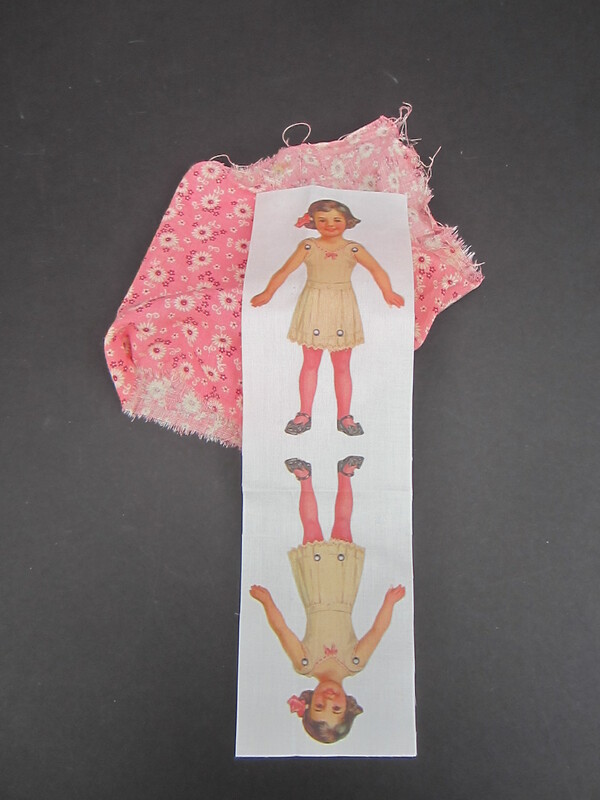 I love this antique pink fabric in combination with this little fabric version of one of my antique Dennison paper dolls. 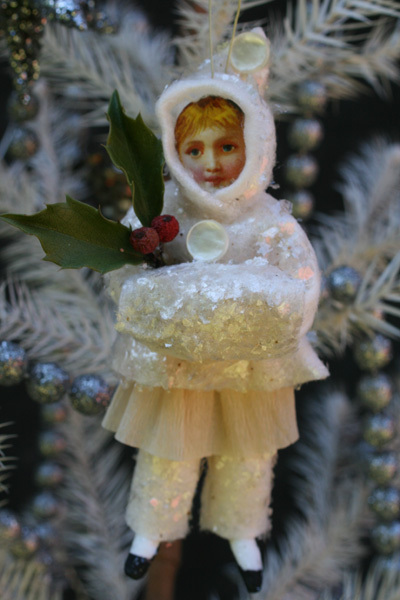 After sewing and stuffing her, dress her in crepe paper frills like the originals. 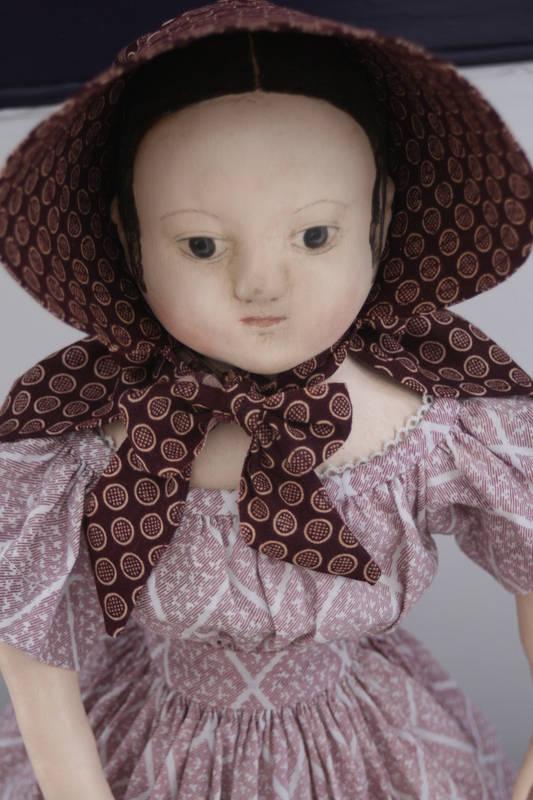 Visit my website to see individual photos of each printed panel and to order my tiny cut and stitch dolls or a reproduction of an original cut and sew antique cloth doll face from my personal collection. 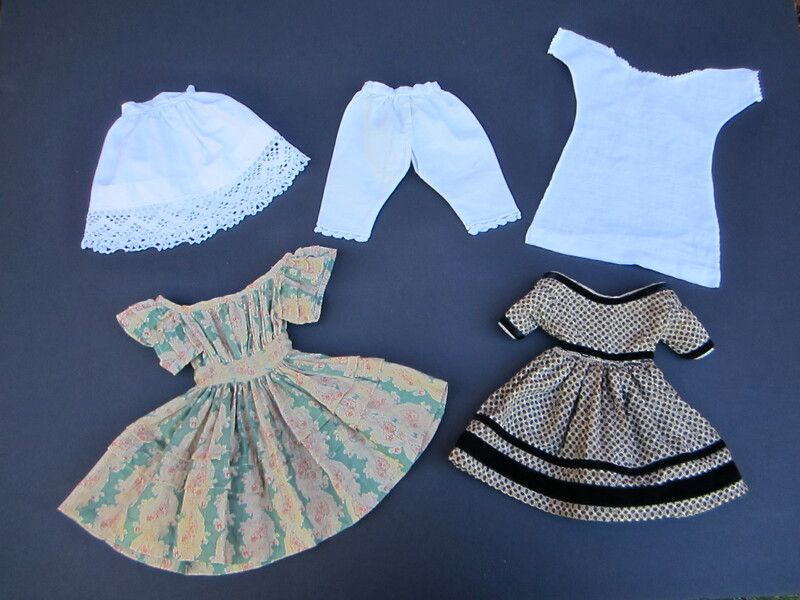 Tiny scraps of antique fabric can be fashioned into clothing for your little dolls. I’ve thought up lots of ways to use my new printed fabric doll panels, but I bet you can dream up even more great ideas of your own! Just for fun, I’m having a contest to see who can design and make the best project using my printed doll panels. The rules are simple. 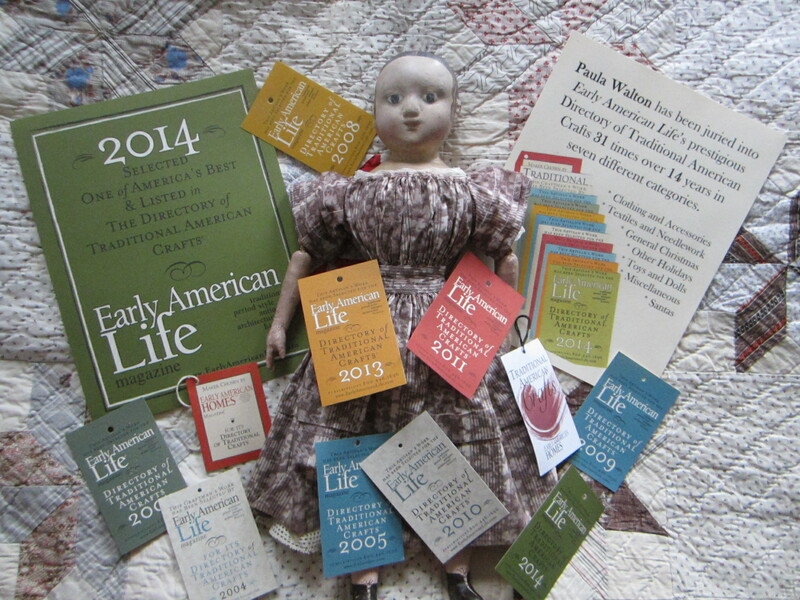 Buy a doll panel, make it into something wonderful, take a photo and email it to me – paula@asweetremembrance.com – before January 31st, 2015. I’ll post all of the photos here on my blog, then invite readers to vote for their favorite. The winner will receive one panel each of my complete collection of tiny cut out and stitch fabric dolls, which is a prize worth $100. Good Luck!!! 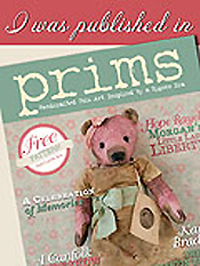 The Winter 2014 issue of Prims magazine. 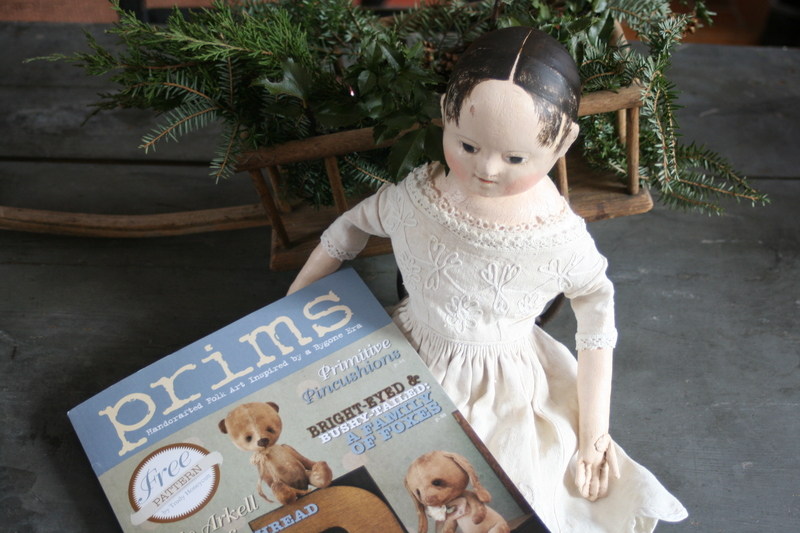 I received my advance copy of Prims Winter 2014 issue right before Christmas. 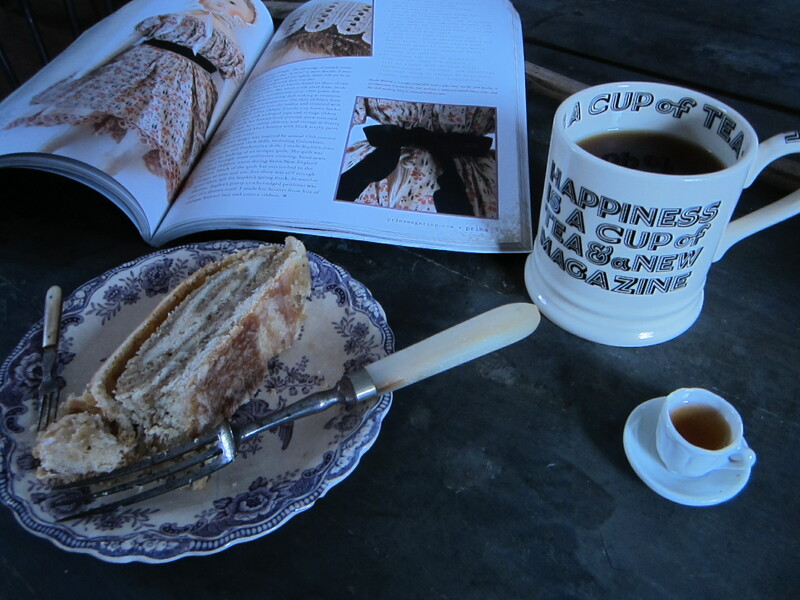 Today I finally found a few moments to sit down with a small friend and look over my article, while we shared a cup of tea and a slice of the wonderful nut roll that Mary sent me for Christmas. 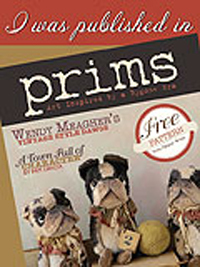 You can read all about my portrait face New England rag dolls when this latest issue of Prims goes on sale January 1st. 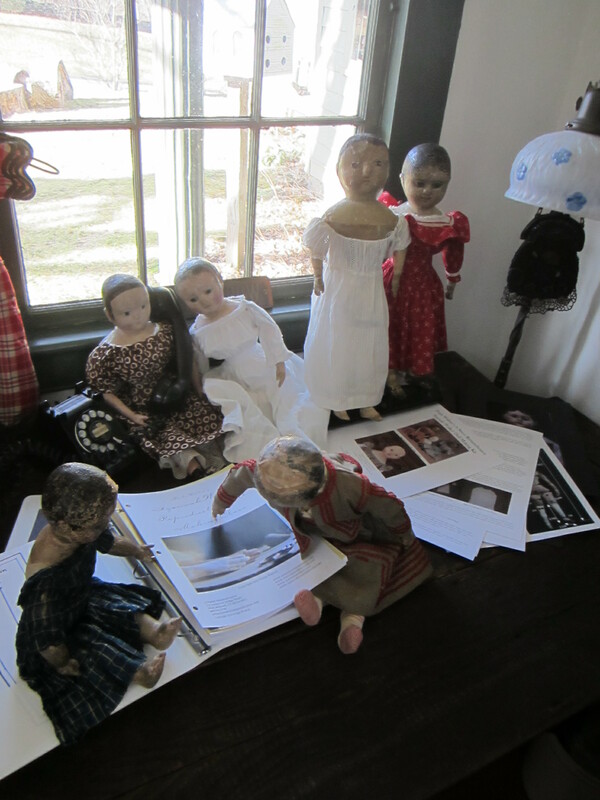 The dolls featured in the article are ones that I made for my Izannah Walker doll making class. 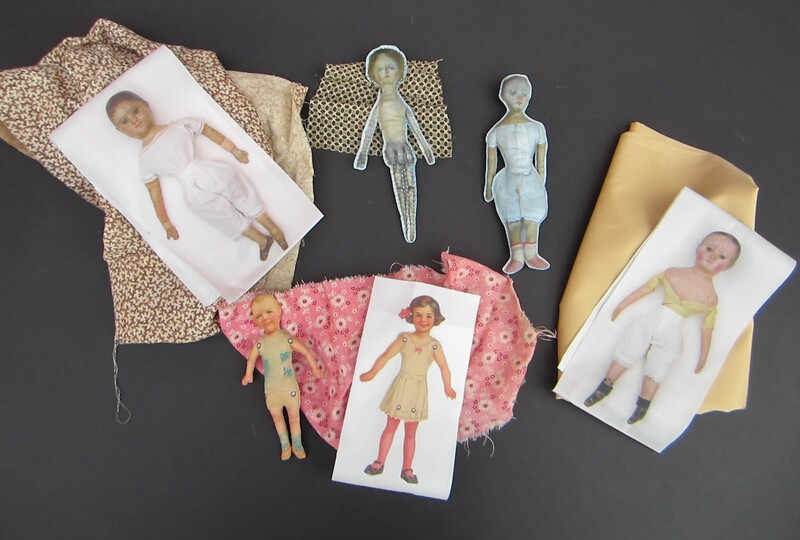 They are variations on the class patterns, that allow class members to create additional types of cloth dolls. All told I made five different variations of my patterns for my students. 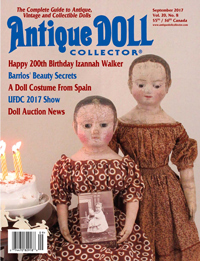 Two of the dolls with painted cloth faces appear in the magazine. 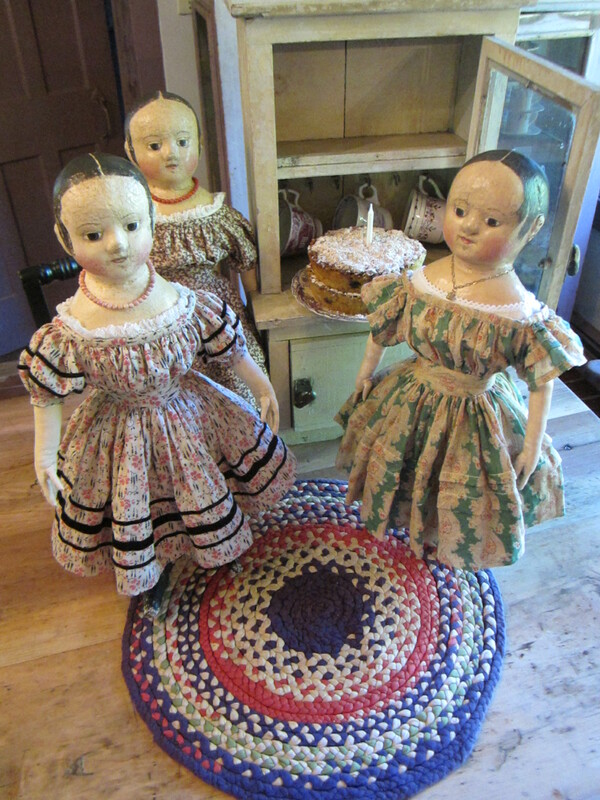 The patterns are free for class members and instructions for making the dolls are posted on the class site. Work in progress. 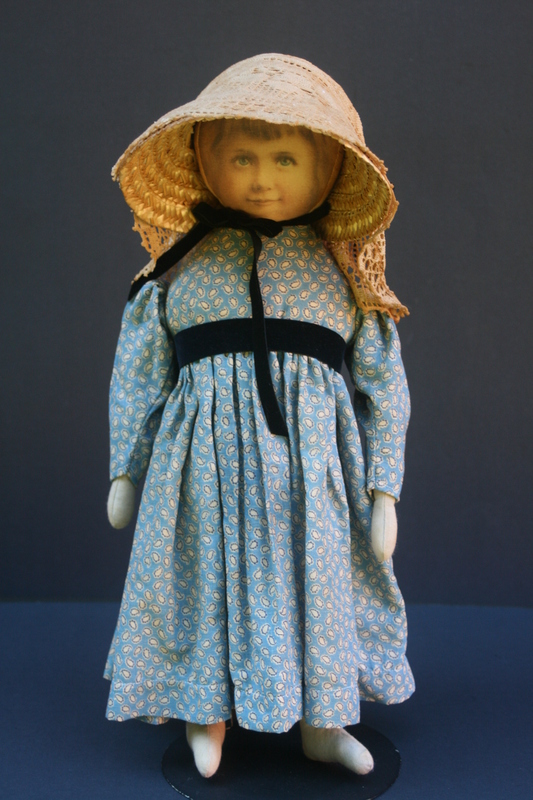 An early photo of one of the dolls shown in my Prims article. 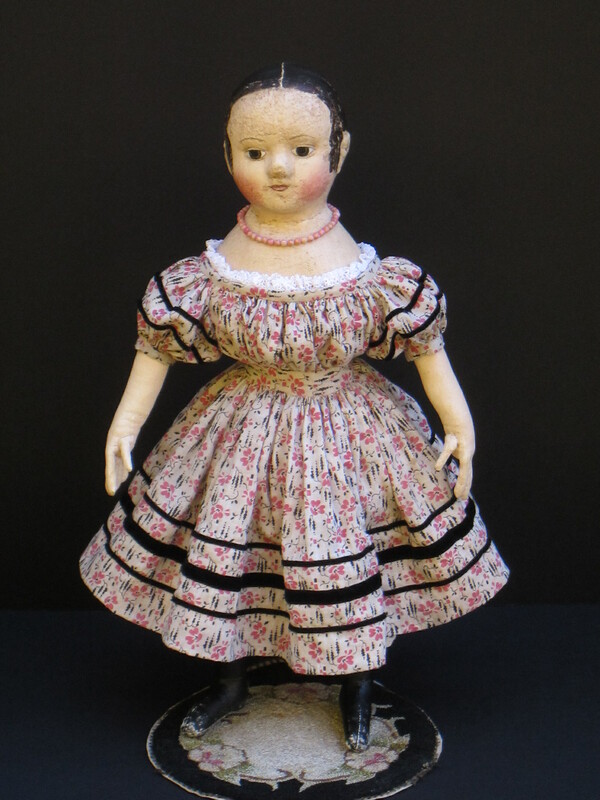 Another view of a doll from my Prims article. 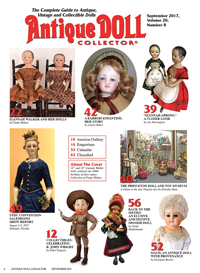 This is my second doll shown in Prims Winter 2014 issue. Another flat face variation made using my Izannah class patterns. 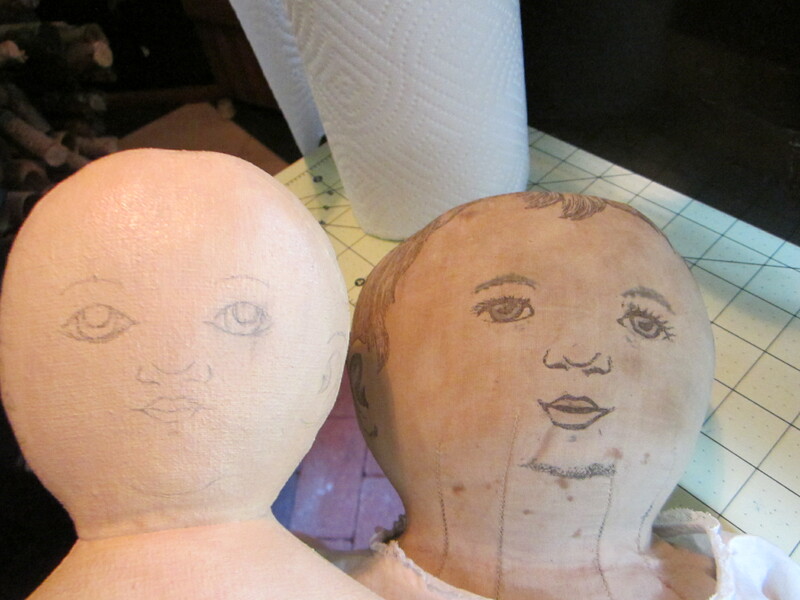 Two more flat face portrait dolls that I made to inspire my students. 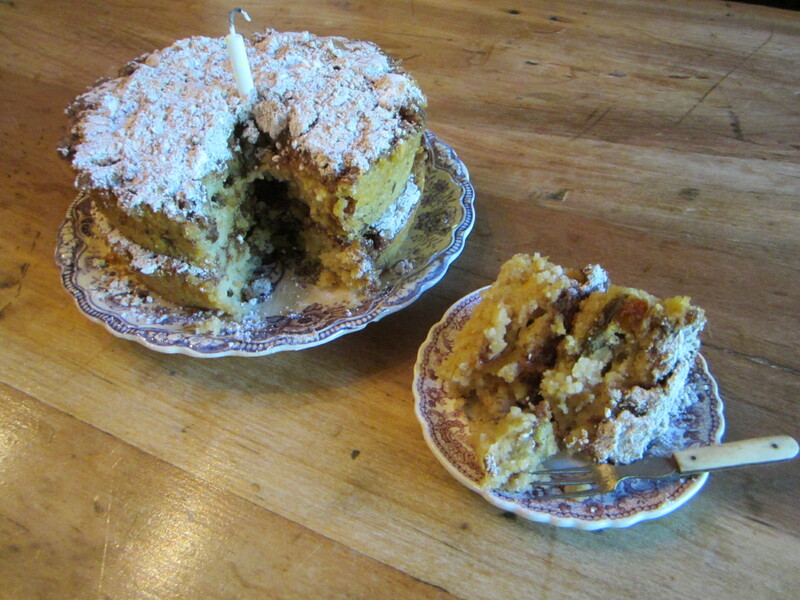 Mary’s sweet yeast dough with a luscious nut filling is an indulgent treat. 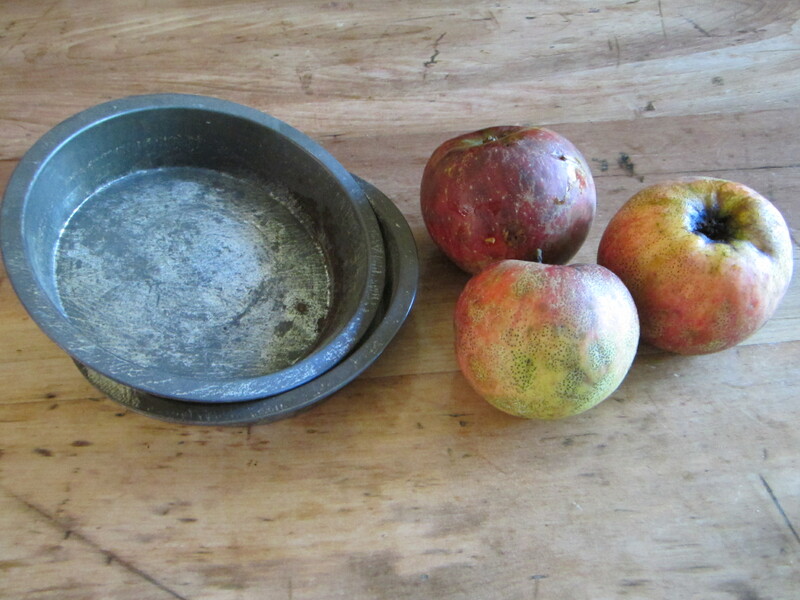 Mary’s grandmother taught her to bake the heirloom family recipe .